Tempeh cooked in a great basic marinade that turns into gravy. Onions cooked with apple cider vinegar and agave for a sweet and sour topping that I can’t get enough of. Classic French potatoes with garlic and parsley. I learned these recipes in my cooking class at the Natural Gourmet Institute and now this meal is a staple in my house. Serve with a big salad to get your greens! Cut tempeh into 4 thick triangles. Place all ingredients into a deep saucepan. Add tempeh. Simmer on low heat for 25 minutes. Take out one cup of the tempeh marinade (without the bay leaf and garlic) and place in a saucepan. Add arrowroot powder and stir over medium heat to thicken. Slice onions into semicircles. In a large saute pan, heat up olive oil and add onions, vinegar, agave, and salt. Cook on medium heat until the onions have softened and there is very little liquid left. Boil potatoes. Simmer until just fork tender. Drain and cool. Heat oil in a skillet, add potatoes and sauté until golden on all sides and fork tender. Season with salt and pepper. Take off the heat. Toss with garlic and parsley. 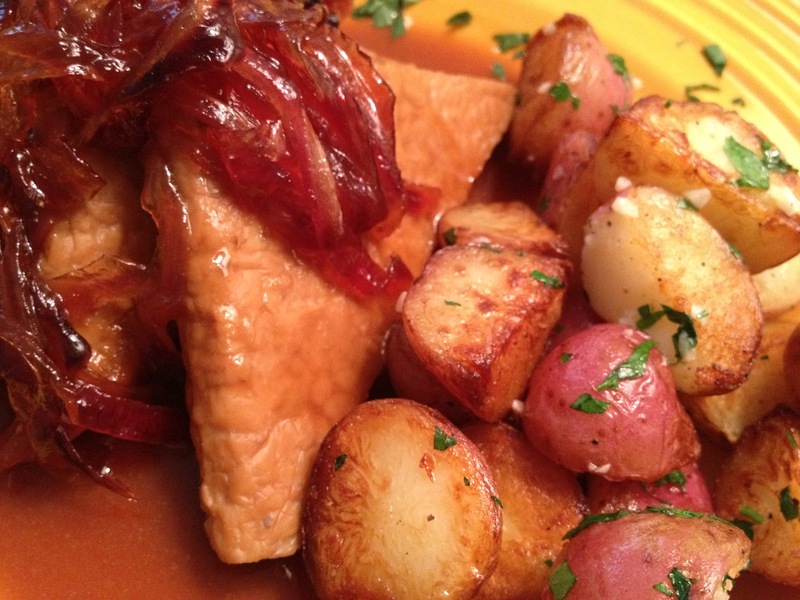 Serve tempeh with gravy topped with relish and potatoes. Enjoy! you make this dish look as good as it tastes! Yum!